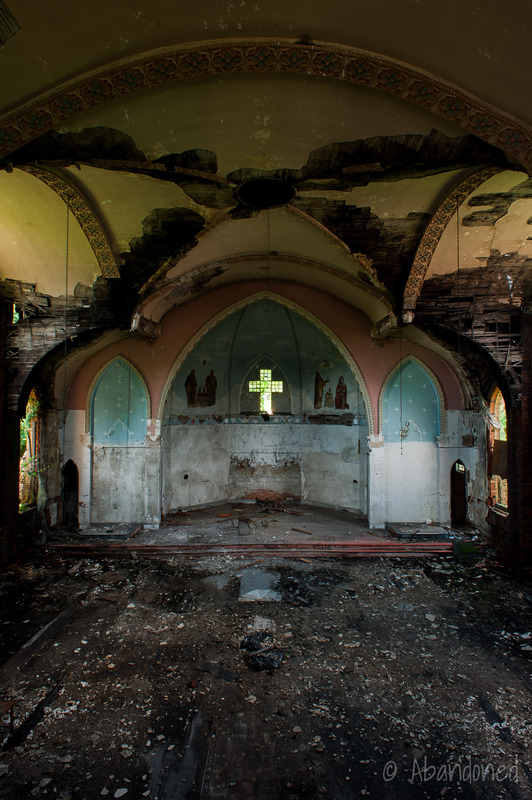 The Holy Trinity Church is a now-demolished Roman Catholic church in Duquesne, Pennsylvania. It was home to a Slovak congregation from 1901 to 1970. The first call for a Slovak church in Duquesne came in 1901, when various worshippers, with the assistance of Reverend Adalbert Kazincy from St. Michael’s Slovak Catholic Church in Braddock, began planning for the new church. 1 Father Kazincy held the first Mass at a worshipper’s home where 46 churchgoers attended. It was followed up with a morning Mass the next day. The gatherings became very popular, although it was straining Kazincy to travel from Braddock to Duquesne. A petition was forwarded by a delegation to Bishop Regis Canevin for permission to build a permanent church in Duquesne. 1 Out of the names suggested for the church, Holy Trinity was selected. A small frame building built in 1901 was soon filled to capacity each Sunday. 1 The first pastor, Reverend Nicholas Hodobay, lived with a local worshiper as there was no rectory. It was not until 1902 that a residence on South First Street was acquired for use as a rectory. The second pastor of the church, Reverend John Uhlyarik, began preliminary work to build a larger brick facility in June 1904. 1 3 The new $40,000 church 2 was designed by F.W. 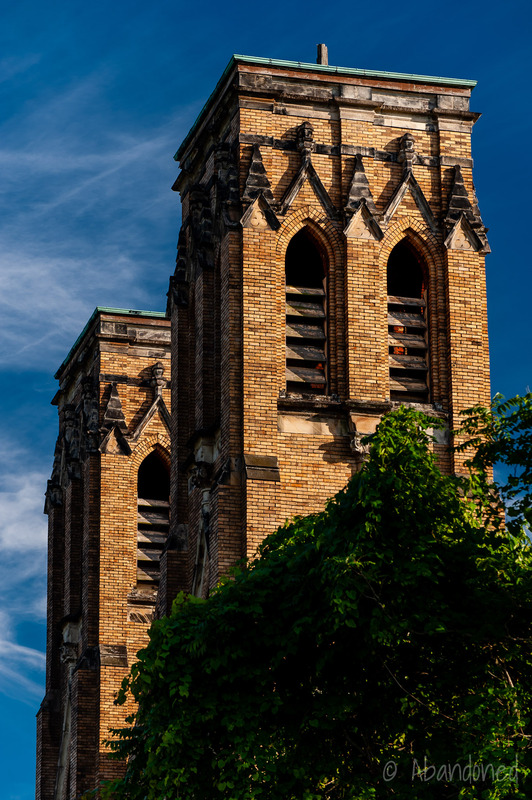 Wilson of McKeesport in the Gothic Revival architectural style. 2 3 The building’s stance on the side of a hill, with its 150-feet tower, would evoke a commanding presence over the Monongahela River valley. 3 Wilson selected buff brick with stone trim for the 110-feet long by the 60-feet wide structure. On October 21, 1904, in a ceremony attended by an estimated 8,000 people, the cornerstone was laid. 3 It was swung into place at 2 p.m. by a bishop, which was followed by a ceremony address by priests and other dignitaries. A parade, complete with eight brass bands, moved through the town. The old frame church structure was converted into a grade school, and the Sisters of the Incarnate Word from Victoria, Texas were brought on as teachers. 1 A residence was purchased adjacent to the rectory and converted for use as a nuns’ convent in 1906. 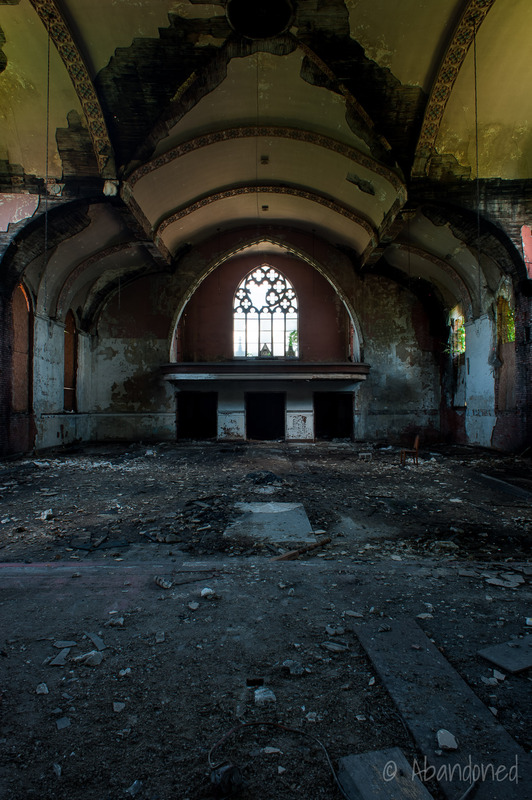 In 1918, 16 acres of land was purchased for use as a cemetery, but heavy debts incurred during construction of the church curbed any major expansion projects until those were paid off in the 1920s. On June 20, 1923, eight lots that belonged to the Carnegie Land Company at South Third and Whitfield Streets were purchased for $9,500 for a three-story, nine-classroom school. 5 Construction began in February 1924, and the school opened in 1925. 1 A brick convent next to the school opened 1926. The Incarnate Word Sisters, facing travel hardships with the commute between Texas and Duquesne, resigned in 1940 and were replaced by the Vincentian Sister of Charity. 1 The original convent and rectory were demolished not long after and a more substantial brick rectory was erected in their place. In 1955, the church and school were extensively remodeled. 1 A new roof was installed on the church, rectory, school, and convent. The twin church spires atop the church building were removed due to structural concerns over fears that they could blow over in a windstorm. Remodeling was not enough for the ongoing costly maintenance plaguing the church. Planning for a new church structure began in the late-1960’s and an architect for the new facility, Joseph J. Balobeck & Associates of Pittsburgh, was selected. 1 The new stained glass windows and Stations of the Cross for the new structure were designed and painted by the Milcho Silianoff Studio of Greensburg. A contract for construction was awarded to The General Contractors of Pittsburgh. A groundbreaking ceremony, held on Palm Sunday, April 7, 1968, was followed with construction beginning on May 7. 1 A cornerstone laying ceremony was held on August 24, 1969, with the new church building dedicated on April 25, 1970. “History.” Holy Trinity Church Roman Catholic Church. N.p., 2014. Web. 30 May 2014. “The Plans Completed for a $40,000 Church.” Duquesne Observer 3 June 1904: n. pag. Print. “Happy Slavish People Lay Fine Corner Stone.” Duquesne Observer 21 Oct. 1904: 1. Print. “Dedication of Church Arranged.” Daily Messenger [Homestead] 7 Sept. 1907: 7. Print. Alzo, Lisa A. “Education.” Slovak Pittsburgh. Charleston: Arcadia, 2006. 74. Print. Iannotti, Ralph. “Duquesne Landmark Church Facing Demolition After Rain-Soaked Roof Collapses.” CBS Pittsburgh, 29 Aug. 2016. D’Antonio, Christine. 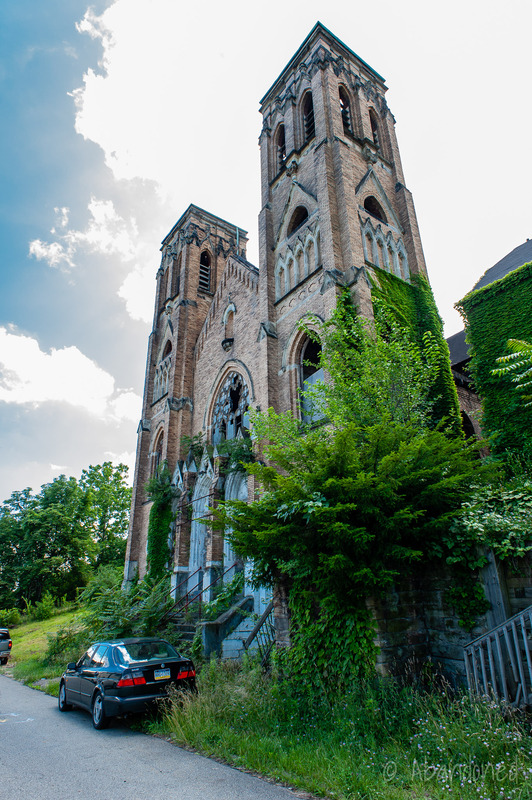 “Crews Developing Demolition Plan For Century-Old Duquesne Church.” CBS Pittsburgh, 30 Aug. 2016. A very telling and interesting read, your manner of storytelling makes one feel as if they were right there living through it. Nice job.